Ankle-length pull-on trousers by PETER HAHN. 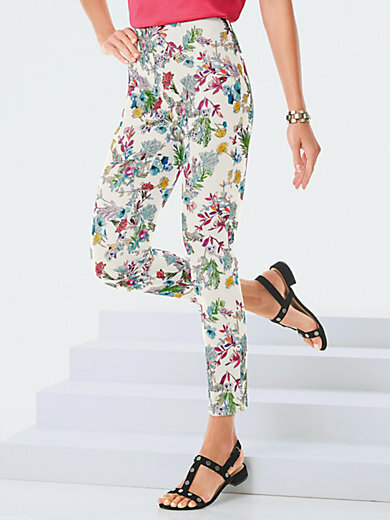 SYLVIA fit in summery lightweight, soft stretch cotton with brightly coloured floral print. Modern pull-on style with fully elasticated interior waistband and mock zip facing. 97% cotton, 3% elastane. Inside leg length in regular sizes approx. 28ins., in short sizes approx. 27ins. Ankle width approx. 11ins. The trousers are machine washable.